KV331 Audio released SynthMaster One! Their SynthMaster Player was an instant hit, but was a bit of a tease for people who want to build their own synth patches. Now they've ported the full-blown SynthMaster to iOS! For those that want presets this arrives with 500 from a long list of professional sound designers. SynthMaster uses a wavetable synthesis engine, with 16 voice polyphony and oversampling to avoid aliasing. It arrives with AUv3, Audiobus, Ableton Link, and supports AirDrop to share your presets across multiple devices. SynthMaster One can even be used with MIDI Polyphonic Expression (MPE) controllers! SynthMaster One iOS is the mobile version of KV331 Audio's SynthMaster One software synthesizer, which was recently voted "The Best New Synth of 2017" by MusicRadar readers. SynthMaster One iOS is KV331 Audio's first full blown synth app for the iPad. It's a powerful wavetable synth with an intuitive workflow. With its simple layout, rich wavetable/waveform content and inspiring factory presets library, designing new sounds with SynthMaster One iOS is a joy. * AUv3: SynthMaster One iOS supports AudioUnits V3, allowing multiple instances to run under supporting DAW apps like GarageBand, Cubasis or Beat Maker. It also supports parameter automation and full screen when running inside GarageBand. * AirDrop: Easily share your presets over AirDrop, Mail or other iOS Applications. 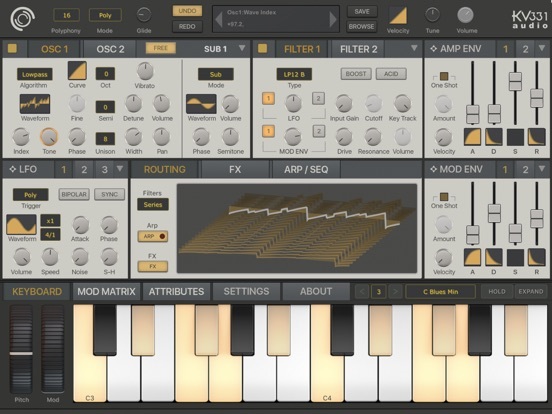 SynthMaster One iOS presets are interchangeable with the desktop version. * Semi-Modular Architecture: For each SynthMaster One instance, there are 2 oscillators with 2 sub oscillators, 2 Filters, 4 ADSR Envelopes, 3 LFOs, a powerful 16 step arpeggiator/sequencer and also 11 different effects that can be inserted on to 6 FX insert slots. The sub oscillators can be connected to the oscillators in 5 different modes which let you use it as a regular sub oscillator or do complex modulations such as ring modulation, amplitude modulation, phase modulation or frequency modulation. * 16 Step Arpeggiator/Sequencer: The arpeggiator in SynthMaster One features classic arpeggiator modes such as Up, Down, UpDown, DownUp, UpDown2, DownUp2, AsPlayed as well as Sequence, Chord and Arpeggiate modes. Each of the 16 steps of the arpeggiator has its own Velocity, Note Number, Note Length, Slide and Hold parameters. * Stereo Oscillators with up to 16 voices Unison: Each of the 2 oscillators in SynthMaster One have stereo output, and can have up to 16 voices "unison". Using the "voices", "voices mix", "detune curve", "detune spread", "pan stread", "tone spread" and "phase spread" parameters, each oscillator can generate a rich "supersaw" type sound. * Zero Delay Feedback Filters: All of the 4 filter categories in SynthMaster One are developed using the zero delay feedback filter technology. With advanced filter parameters like input gain, drive and acid, you can get that "analog" sound from the filters! * Rich Set of Effects: SynthMaster One features 11 different effect types: Distortion, LoFi, Ensemble, Phaser, 6 Band EQ, Compressor, Vocoder, Delay, Chorus, Tremolo, Reverb. * Microtuning: SynthMaster One supports Scala tuning, so tuning can be set either for each preset or globally by loading from a Scala tuning file. * Preset Browser: SynthMaster One features a comprehensive preset browser with separate search criterias for instrument type, preset attributes, music style or preset author. Reader Red Sky Lullaby posted preset demo. Embedded here is a comprehensive playlist from KV331. Synthmaster player is the "play presets only" version of their monster SynthMaster, Synthmaster One is a port of their 2017 release which is a lot more accessible than the original Synthmaster as it is only a single layer rather than the two layer Synthmaster, the original also features wave/additive/wavetable and vector oscillators (two for each of the two layers). I have been testing this iOS release and it is completely awesome... still kinda wish they would port the original over too though.. I am nothing if not ungrateful and greedy! What are the differences between 'SynthMaster' and 'SynthMaster One' (PC versions) ?? Tim, I’m feeling some new kind of SynthMaster Love. I hope you do a video on this soon. Had preordered it, bought it right away, been rather pleased with some patches… but there’s a lot to be said about quality control. This is a really neat softsynth to explore all sorts of neat sounds. It’s pretty unique, deep, and not that hard to use, once you understand a few things. But it feels like a work in progress, despite being a few months late. It sounds like Bülent’s strategy is to release things officially and act as quickly as possible based on forum feedback. Could work, but he’d need a bigger team. Don’t get me wrong. It’s a neat app. No regret buying it on day one. But it’s an unfinished product, it sounds like. This isn’t the kind of thing you put in your system and work through hours upon hours of headache-free creativity. It’s the kind of app you go “oh, maybe it’s worth spending some time exploring this one feature which may or may not work as expected… nobody knows since the documentation isn’t ready… it’s ok, since it’s one artist’s neat project and we’re all in this together trying crazy stuff as we go along…”. There’s a lot of love for an app like this. Much of it is based on expectation and respect for the individual who made it. But we’re not talking about the kind of solid synth which can take a beating and still gives you the results you expect. It’s software for adventurous people who enjoy bug tracking (without a centralized bug tracker). Have been beta testing it. Some amazing sounds and easy to learn. Wasn't a fan of the synthmaster player but this thing is good. Anonymous comments are closed for old articles. If you'd like to comment please Register. discchord.com is licensed under a Creative Commons License.